Shirts With Random Triangles: Arkansas RB Alex Collins Declares For 2016 NFL Draft. 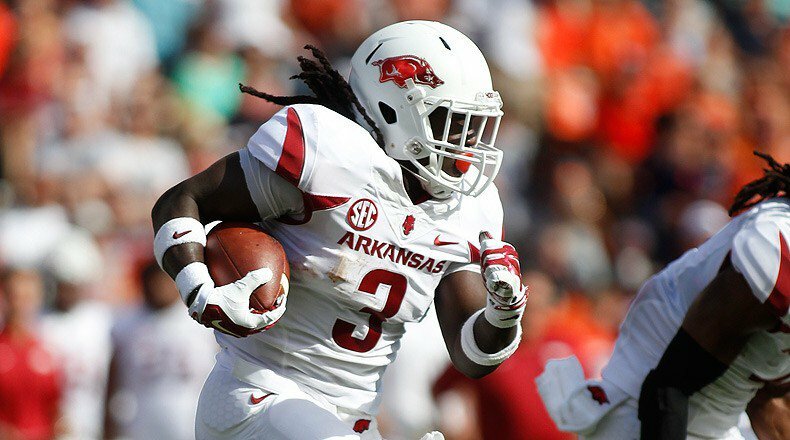 Arkansas RB Alex Collins Declares For 2016 NFL Draft. Alex Collins. Image via athlonsports.com. Alex Collins is an ex-Razorback. The Arkansas running back has announced he is forgoing his senior season to enter the 2016 NFL Draft. Arkansas released a statement from Collins in which the RB described going through the process of making his decision to enter the 2016 NFL Draft. "For the past week, I have spent my days and nights with much prayer trying to decide my future at the University of Arkansas. Without a doubt this has been one of the most difficult weeks of my life as I try to make the right decision for my future. If I return, getting my degree and perhaps breaking new records would be within my reach. To be able to share those records and awards with the team and fans would be an incredible experience for all of us. I also see a future in the NFL as a once-in-a-lifetime opportunity. After much prayer and discussion with the people who love me, I have made the decision to enter the NFL Draft." Collins ran for 1,577 rushing yards, in the 2015 season, along with with 271 carries, and 20 touchdowns. Saturday Down South ranked Collins at no. 3 among SEC running backs in 2015.